Special dogs require special diets to help them stay fit, healthy, and full of energy. Grass fed lamb and goat meat from Shepherd Song Farm provides your dog a natural, grain-free alternative to standard kibble. 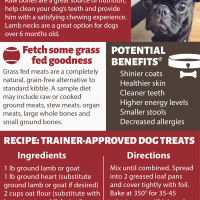 Read this infographic for more details and a tasty Fido-approved dog treat recipe!